Delicious easy and perfect for quick, hot meal during these busy days and evenings. If you find yourself running around all day and can’t imagine finding the time to make yourself and your family a hot meal, consider putting these shrimp cakes on the menu. The prep time is right around five minutes, and cooking is under ten. The diavolo sauce can be put together while your shrimp cakes rest uncooked. You might even serve these shrimp cakes with purchased tartar sauce or your favorite recipe of the same. However you choose to serve these, they won’t take much of your time at all. These cake go together so quickly because the ingredients are pulsed in a food processor. Just not all at once. The shrimp are the last ingredients to go in, and they should barely be pulsed at all. Just enough to very roughly chop the shellfish. If you are concerned you might overprocess these cakes, feel free to chop the shrimp, by hand, into dice-sized pieces. Too small, and the consistency could be too homogenized and commercial tasting. Too large and your shrimp cakes won’t be able to hold together during cooking. Instead of French bread crumbs as our binder, we’ll be using panko bread crumbs. Their crunch adds a much needed texture to these cakes. Half the crumbs go into the mixture and the other half will be used to coat the shrimp cakes before frying. We’ll be using egg whites to hold all this together. If your cakes aren’t holding together, you might need another egg white. Just add another white to the workbowl and quickly pulse to combine. Once you get your shrimp cakes formed and coated in additional panko bread crumbs, they can rest while you put the diavolo sauce together. A half cup of garlic seems like an insane amount of garlic, but it’s the very definition of diavolo. Don’t skimp on the red pepper flakes either. 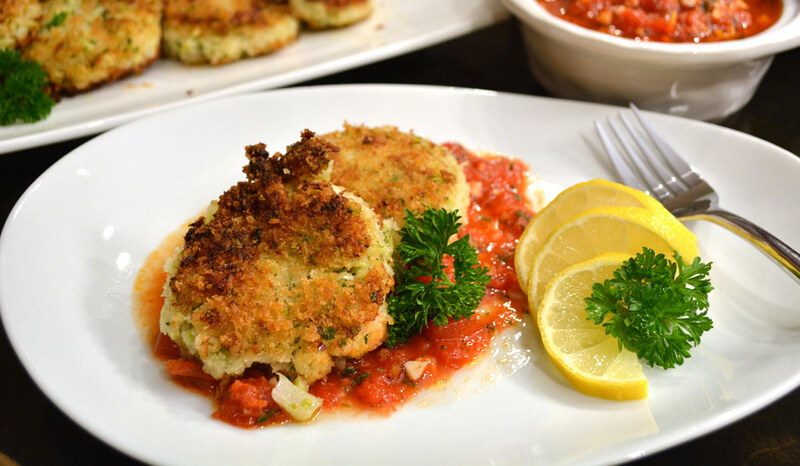 These shrimp cakes have a mild flavor and are intended to be eaten with the diavolo sauce, as this entire recipe is a twist on the classic Fra Diavolo shrimp sauce. The sauce only needs to simmer for a short amount of time which can be done while the shrimp cakes are frying. Normally, we cook seafood for two minutes. These shrimp cakes will need to go for just a touch longer than that. Make sure the oil is quite hot before adding the cakes to the pan. If you add the cakes to early they won’t adequately brown before they need to be turned over. While this won’t affect the flavor that much, the cakes won’t be nearly as crunchy or visually appealing as properly browned shrimp cakes. They should cook between three and four minutes a side to form a rich brown crispy crust. If you’ve got less than 30 minutes to put dinner on the table, reconsider a precooked or ordered meal in favor of this fresh take on a classic fiery seafood meal. Pulse 1 cup of panko and everything except the shrimp and oil until the vegetables are minced finely. Add the shrimp and pulse just to combine. Do not overprocess. Divide the mixture into eight shrimp cakes. Shape cakes and coat in remaining cup of bread crumbs. Set aside. Sautee the garlic and pepper flakes in the olive oil until the garlic becomes tender and fragrant, about 2 minutes. Do not allow the garlic to brown. Add the tomatoes, sugar, salt and pepper and simmer on low while you fry the shrimp cakes, 3-4 minutes a side in a large non-stick skillet in the canola oil. Fry the shrimp cakes in batches of four if necessary. Place the cakes on a hot serving tray. Remove the diavolo sauce from the heat and stir in vinegar, parsley and lemon zest. Plate by placing a ladle of diavolo sauce on the plate and arranging two shrimp cakes on top. Garnish with lemon and parsley.